With iOS 12, Apple introduced a native time-tracking feature for your iOS device, known as Screen Time. Screen Time gives you detailed usage statistics of your iOS device and gives you an overview of time spent on different apps, This may be helpful for users who are seeking insight on how they spent time on their devices, and perhaps work towards improving their digital lifestyle. While we can expect similar Screen Time functionality on macOS in the upcoming releases, there’s no such native feature in macOS at the moment. In this article, we’ll look into some third-party time tracking apps on macOS that allow you to get insights on your Mac usage statistics. Timing is one of the best time tracking apps available on Mac right now. It automatically monitors your activities while running on the Mac menu bar and gives you an overview of your actions depending on the apps and websites that you use or visit, and the time you spend on each of them. It can then categorize your activities into several types of tasks, such as web browsing, education & research, office & business, file management, etc. 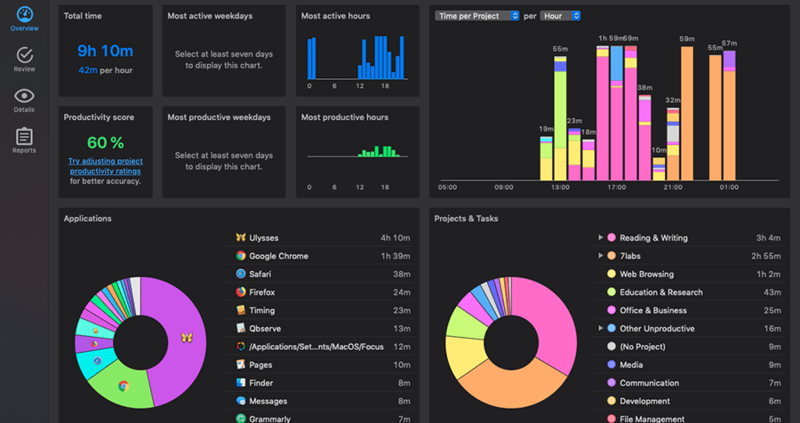 All your recorded activities are presented in a concise dashboard, giving you an at-a-glance perspective of how you spent time on your Mac, how productive you were, and so on. If you have a specific task to complete within a given deadline, Timing lets you create custom projects and tasks, letting you automatically track their progress throughout the day. But if you forget to add it, that’s okay too. You can easily assign the recorded activities to a project or a task, at a later time. Sometimes, a particular activity might be recorded but not categorized automatically. You can always come back to these and assign them categories manually in your own time as well. Timing even lets you track activities you perform away from your Mac. Every time the app detects an idle session, you can configure it to ask you to manually enter activities for the time spent away. Timing assigns you a productivity score based on the analysis of tracked activities. This score is always shown at the top of the menu bar and may be helpful in motivating you to stay more productive and spend less time procrastinating. Timing, by default, stores all your activity data securely on your Mac. There’s an optional sync feature, which lets you sync your activities across multiple apps, which requires storing of data securely in the cloud in that case. Timing app is available for one-time purchase in three packages. The basic Productivity package costs $39 for up to two Macs; the Professional package costs $69 for up to 3 Macs; the Expert package costs $99 for up to 5 Macs. Alternatively, the Expert edition of Timing app is available on Setapp, which unlocks this and 100+ other paid apps for use on up to two Macs, for a subscription fee of $9.99 per month. RescueTime is an activity tracking app available for Mac, Windows, Linux, and Android, which automatically tracks your usage and generates web-based reports of your various activities recorded on your Mac and other devices. Similar to Timing app, the RescueTime app resides on the Mac menu bar, captures the usage of apps and websites, and categorizes them into the different type of activities. A few significant differences notably exist between Timing and RescueTime. First, unlike Timing, even though RescueTime resides as a menu bar app on your Mac, all your preferences and activity reports are available only on the web. However, this also means that your recorded activities have to be stored in the cloud, though RescueTime assures that the data is secure and only accessible to the user. Second, RescueTime can sync and display usage statistics on Macs, Windows, Linux, and Android, so long as all the devices are linked to the same RescueTime account. Timing, on the other hand, is currently available only for Macs, and only supports (optional) activity syncing among multiple Macs. Third, RescueTime includes a powerful FocusTime feature (available only in the Premium version), that blocks access to a predefined list of websites for a given amount of time. This is particularly useful when you have a looming deadline and want to prevent possible distractions. Similar to Timing app, RescueTime gives you a dashboard view of your activities, along with a productivity score based on your activities, which might give you a perspective about how productive you really are throughout the day. It also lets you create time or activity based goals and track them. RescueTime is available in two versions, a Lite version, which gives you access to limited features free of cost, and a more powerful Premium version which gives you access to all the features a subscription fee of $9 per month or $72 per year. Qbserve is yet another automatic time tracker app for Mac, which provides an overview of your time spent on the device. It categorizes activities into three major groups — Productive, Neutral and Distracting. For most apps and websites, Qbserve can automatically categorize tracked activities, but just in case something isn’t correctly categorized, you can specify them manually and the app remembers that for future references. Similar to Timing app, Qbserve shows the tracked data in an Overview dashboard, in a much-simplified manner compared to Timing. You can, however, access the detailed activity logs through the app’s interface, if you want to find out how much time you spent on a specific activity. You can also set productivity goals, and set alerts to go off once they are achieved. Alerts can be integrated with other services and apps via AppleScript, IFTTT and Zapier. 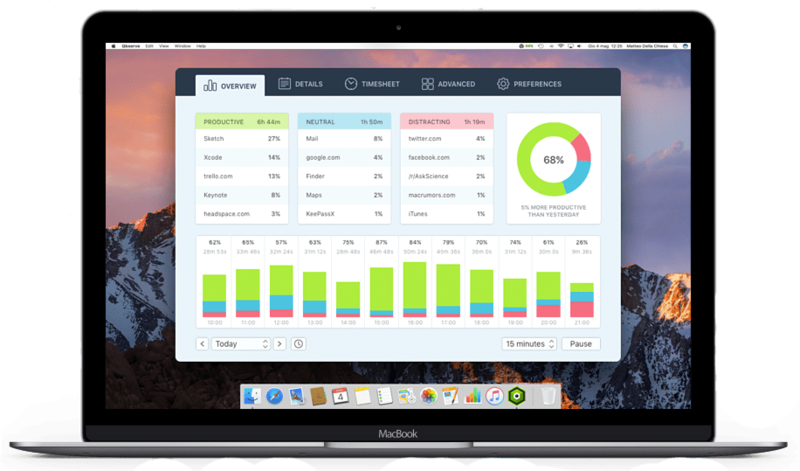 Qbserve stores all its collected data locally on your Mac and never sends them anywhere. This is an important feature catered towards privacy enthusiasts, but at the same time, it prevents any cross-device syncing by design. Qbserve offers a one-time purchase license of $40, enabling you free upgrades for a lifetime. At this price, Qbserve may be one of the most affordable offerings among premium time tracking apps. If you’re looking for a simpler app that lets you access to Screen Time-like features for free, you might want to check out WasteNoTime. WasteNoTime is a free web browser extension available for Chrome and Safari that enables you to track your time spent on different websites and present them in a simple graphical format. The app, being a browser extension, is limited to tracking web browsing activities on the particular browser you install it on. So, even though it’s available for Chrome and Safari, cross-browser data syncing is not possible. Also, it can only track your web browsing activity, not the time you spend using other apps. 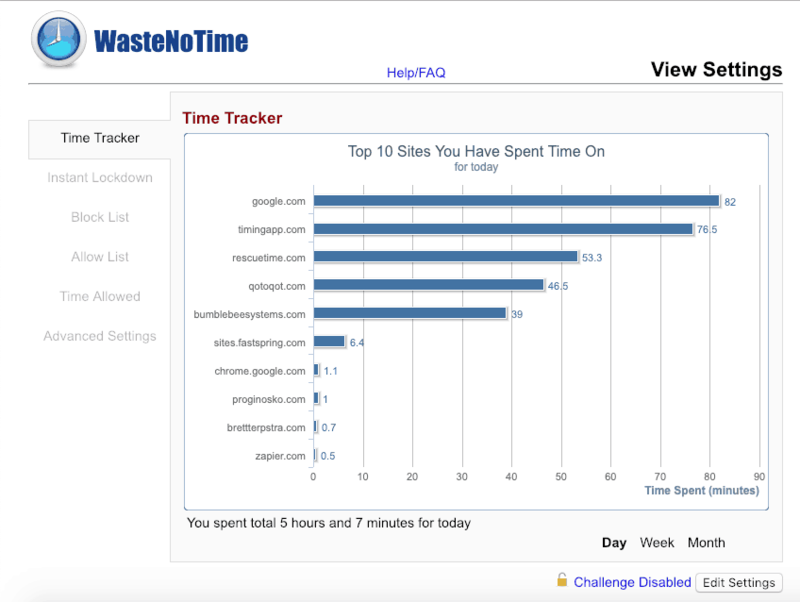 When the extension is enabled, WasteNoTime can provide time tracking for the top 5, top 10, or top 20 websites you visit during the day, week or month. It also has a feature that allows you to allow or block specific websites for a specified duration. This can help you to avoid getting distracted and focus more on your task. WasteNoTime is available as a free extension on the Safari Extension Gallery or the Chrome Web Store. These are some of the well known time-tracking apps available for Mac, which serves as good (even better in some cases) alternatives to Screen Time on iOS 12 and above. But, if you do know of another app which you feel deserves a mention here, let us know in the comments below.